Featuring presets created by today's hottest guitarists. At the heart of the RP200A Artist is our own AudioDNA™ super chip, offering you the tones of the greatest vintage and modern Amps ever made, acoustic guitar simulation, and a host of programmable effects (up to 11 simultaneously). The 6-character display and knob-matrix based user interface provide simple, straight-forward editing. Up to 3 adjustable parameters per effect give you the flexibility to create the exact sound you're looking for. the built-in expression pedal lets you control your choice of parameters when performing live onstage. The Drum Machine is a great tool for improving your timing, rehearsing different musical styles, or just jamming with friends. The Drum Machine plays sampled drum beats in an infinite loop allowing you to select different patterns, change tempo, and adjust the volume level. And the Chromatic Tuner lets you quickly check or tune your instrument to one of 4 different tuning references. Hi, I have an RP200. But last time I tried to connect its dc power supply to another pedal and since that it doesn't work any more. I would like to know if there is a way I could aquire another power supply or can I replace it with a similar kind? What is the correct power supply or adapter for the RP200? The RP200 requires a very specific power adapter. The adapter has an AC output rather than DC. The RP200 will NOT work with a standard DC adapter. The correct model # is PS0913B-120. The retail price is $24.95. You should be able to purchase one from your local Digitech Dealer. 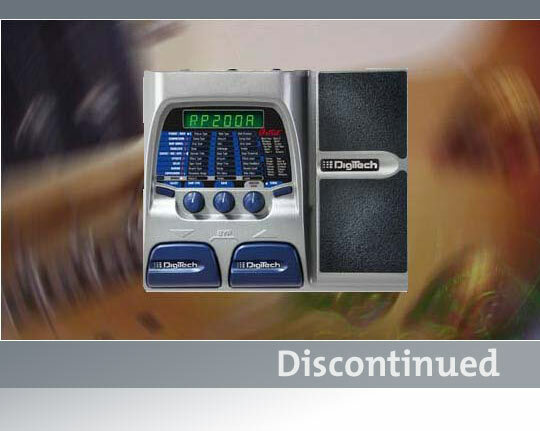 Or, if you prefer, this part can be purchased directly from Digitech by calling (801)566-8800. You may, instead, send a check or money order to the address below. Be sure to indicate which part you're requesting in your letter. 7) Press either Footswitch. The RP200 will return to the last selected Preset and the Expression Pedal is now Calibrated. How do I reset and calibrate the pedal on the RP200?